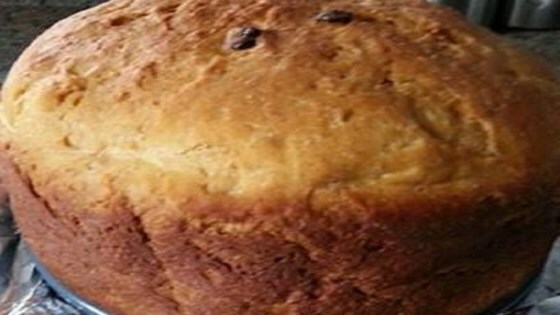 "This recipe calls for both a bread maker and an oven, and is more rich and flavorful than most -- you just can't find many panettone recipes that have rum or cream. It took a while to perfect this recipe, but feel free edit it to your own liking! Enjoy this beautiful bread during the holidays!" Place the milk, cream, rum, vanilla extract, butter, eggs, sugar, salt, lemon zest, flour, and yeast into the pan of a bread machine in the order listed. Set machine to Bread Dough for a 1.5 pound loaf; press start. When dough has been kneaded 10 minutes, add the candied fruit, raisins, and chopped almonds and continue to knead. Grease 2 9x5-inch pans. When the kneading and rising cycles of the bread machine have completed, remove the dough. Turn out onto a lightly floured board and divide into two equal portions. Spread dough into prepared bread pans. Cover loosely with plastic wrap; allow to rise for 1/2 hour. Preheat an oven to 350 degrees F (175 degrees C). Whisk together the egg white, water, 1/4 cup sugar, and the sliced almonds. Spoon mixture evenly over loaves. Bake in preheated oven until a knife inserted into the center of a loaf comes out clean, about 35 minutes. Cool on rack for 5 minutes before slicing. Serve warm or at room temperature. Watch Chef John make this classic Italian Christmas bread. Half and half or light cream can be used instead of heavy cream. Sorry, yes, the recipe yields a slow-rising dough. 30 minutes will yield a thick, cake-like bread. 2 hours - as you said - should be enough for those loyal to lighter Panettone breads. Sam can this recipe be done only in oven or does it have to be used with a bread maker? Made this today, with just so so results. I did let it rise for about 90 minutes, but it fell and the bottom, when baked, was quite soggy.